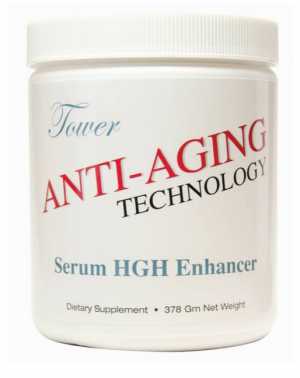 Tower Anti-Aging Technology is a nutritional complex containing high arginine, ornithine, glutamine, glycine, pantothenate, B6, lysine and vitamin C (ascorbic acid). Ingredients have been shown to stimulate HGH production by the pituitary gland in some people, especially in the absence of light (take in the evening and sleep in dark room). One jar equals up to a 1-month supply of Tower Anti-Aging Technology. Mix 1 teaspoon with 8 oz. water twice daily. L-Arginine 3000mg Vitamin C (Ascorbic Acid) 3000mg L-Lysine 1000mg L-Ornithine 1000mg L-Glutamine 2000mg Glycine 1000mg D-calcium Pantothenate (B5) 200mg Pyridoxine HCL (B6) 10mg Stevia 60mg. WHEN PURCHASING IN BULK, PAULING THERAPY PRODUCTS SHOULD BE USED WITHIN FOUR MONTHS OF THE DATE OF PURCHASE FOR MAXIMUM FRESHNESS. PRODUCTS CONTAIN NO PRESERVATIVES AND ABSORB MOISTURE WITH DAILY USE. Wholesale price per jar for 12 jars - $42.36.